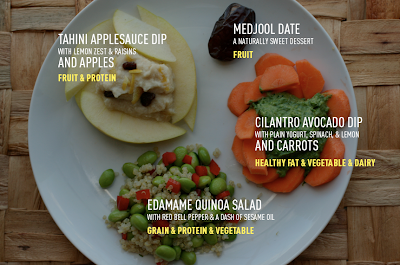 I submitted this meal to Good Magazine's contest, Make a healthy, delicious student lunch. My lunch is for elementary school kids, kindergarten and up. These kids love to dip things and play with their food. Dips are great, because you can sneak vegetables in without the kids noticing. For example, the cilantro avocado dip contains spinach. I designed a meal that was colorful, vegetarian, easy to eat and make. 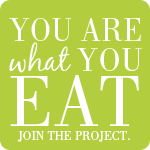 Each dish contains only a few simple, organic ingredients that together creates a balanced meal. Imagine if this was the lunch option kids were offered instead of frozen (processed) chicken nuggets and canned peas and carrots. Incredible lunch for both a kid or an adult! This is wonderful, Adrienne! I like how you could make all the elements in larger quanities to store or pack more than one lunch! What else is in the tahini/applesauce dish? That's it. I like to dip apples or eat it like a pudding. All these recipes are easy to make, pack for lunch, and eat! Oh and they're tasty too. Kristen - your crackers would be perfect for the avocado dip! That's a nice childrens lunch colorful and delicious and nutritious good on you! you are rockin gurl, hope you win!! !